It has been a tough year for Mr. Juleus Ghunta. In fact, so tough that he thought he was going to die. He was diagnosed with epilepsy this year and at one point, he couldn’t even walk. 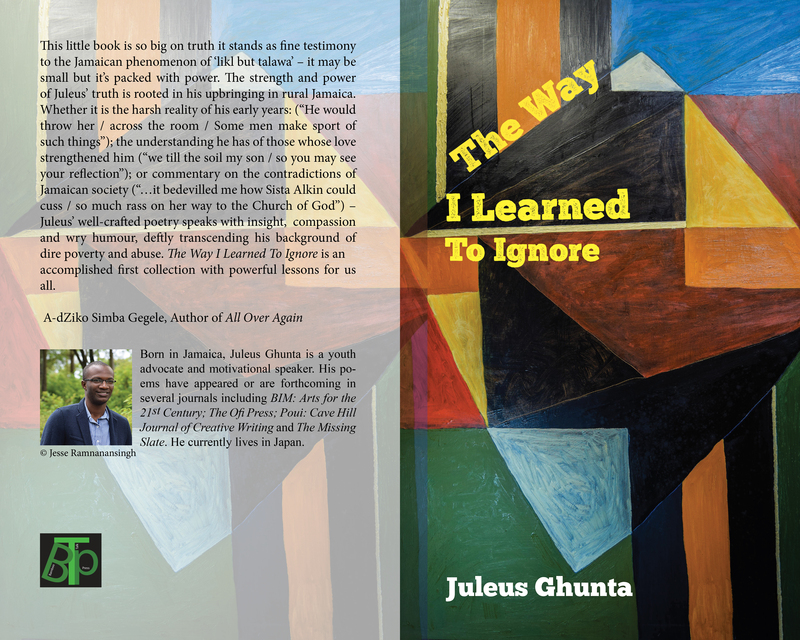 Despite this experience, Juleus, 27, has just published a poetry chapbook called The Way I Learned to Ignore. The book contains 21 poems, and was printed by a Trinidad-based Bamboo Press. Juleus says writing does not come naturally to him, but that it acts as a catharsis. It is also a way for him to translate and make sense of some of the difficult things he endured as a child. Here is one of the striking lines from a poem describing something he witnessed: “He would throw her / across the room / Some men make sport of such things”. He hopes this book will launch him on to a larger platform (he has already earned the Prime Minister’s National Youth Award for Excellence), from which he can speak about the horrors that children endure, not just in Jamaica and the Third World, but all over the world. Juleus currently lives in Japan, and cites Edward Baugh as an influence. He reads Baugh’s poem, “I Wish You a Leaf Falling” every day, and also enjoys the poetry of contemporary writers like Kei Miller, Tanya Shirley, Lorna Goodison and Vladimir Lucien as influences. In addition to this wonderful book, Juleus has been published many times in journals. Check out one of his poems below and Congratulations Juleus! My grandmother feared ghosts. I mocked her. Alone, I learned that despair is a graveyard. who, like rain, seep into crack-riddled homes. There was a stream in the valley behind my house. and hummed a sadness stretched and deep. it could have been the eye of a hurricane. Beautiful, touching words. Creating is important for every human being.